At the heart of a successful construction company is the workforce; having a team of professional, efficient and skilled employees is tantamount to success, or at least half the battle. The other half of the battle is retaining your amazing workforce. High construction turnover can have major repercussions to the quality of work your company produces, as well as your ability to deliver even basic services. 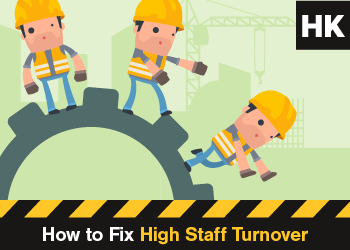 In this article, therefore, we’ll be looking at how you can fix high staff turnover in your construction company. In doing so, you’ll ensure that your construction company continues to succeed for years to come! Whereas staff may often leave your employ of their own volition if they are unhappy, there are times when you may have to get rid of staff yourself. Whether they’re not up to the task, they don’t deal well with your team, or have the wrong attitude for your company’s ethos, knowing early on that staff aren’t right for your company is essential. You should use temporary-to-hire firms or utilise probation periods for prospective staff. In this way, you can gauge whether or not someone is right for your company. If they’re a perfect fit, you’ll likely reduce your staff turnover rate dramatically. Look especially at whether new staff share characteristics with your current ‘superstar’ employees, if they have the skills and attitude to succeed in the company, and look for quality references, too. Nothing poisons the company well more than having a horrid working atmosphere. If your staff simply don’t enjoy coming into work, no matter what the reason is, they’re likely to leave before long. If there are problems between staff members – for instance, if someone isn’t holding their weight against other, more productive employees – or you treat your employees with a lack of respect, they will seek greener pastures. Likewise, if staff are overburdened and under too much stress their job satisfaction will plummet and you’ll see high staff turnover. Make your company as friendly, as welcoming and as fun to work for as possible. Improving job satisfaction and happiness in the workplace will allow you to retain quality, hard-working staff. In turn, you’ll see productivity, and therefore profitability, skyrocket. But it would be a mistake to ignore the elephant in the room: pay and company benefits. If there’s one thing above all else that can increase staff turnover, it’s low pay and a lack of benefits. Staff who feel undervalued will often be snapped up by other companies offering more competitive rates. Other times, staff may leave not for higher pay but for better benefits. It may even be the case that your staff will take a pay cut in preference to the benefits offered by your rivals! To avoid losing your staff to other, rival construction companies, simply offer a range of benefits and a competitive salary. Doing so from the beginning, during the hiring process, will also attract the brightest and best individuals to your company, further ensuring continued success. Staff also often leave a company when they feel that the work is stagnating, or becoming boring. A great way to avoid your staff leaving in search of more exciting work, work that enables them to grow, develop and keep their mind engaged, is to offer additional training programmes. By investing in your staff, you will show that you appreciate them. Similarly, you will allow them to develop new skills that will improve their productivity in the workplace. But, above all, you will demonstrate that your company has more to offer to staff. Ultimately, employment is a two-way street, and you need to offer benefits and growth opportunities to staff as opposed to simply taking. Training initiatives are a great way to solve this issue and reduce staff turnover.